For work, I've been having to keep an eye out for reports from the U.S. Government Accountability Office (GAO) that relate to government contracting and procurement. But GAO reports on a lot of interesting stuff, so while I wouldn't say I'm reading GAO reports for fun, I'm definitely reading a lot more of them. 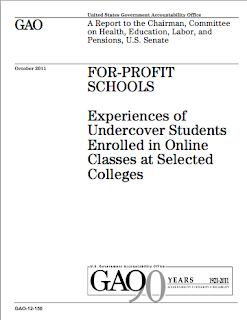 In For-Profit Schools: Experiences of Undercover Students Enrolled in Online Classes at Selected Colleges, GAO looked at 15 for-profit institutions that offered online classes, and found that 7 of the 15 didn't follow their own policies on plagiarism and substandard academic performance. "For a written exam that required the student to submit detailed explanations to four questions, the student submitted photos of political figures and celebrities." I picture an undercover GAO investigator/Redditor, trolling the assignment by sending advice animal pictures. The student received a passing C-minus grade. That's the most amusing tidbit I found. The report also looks at admission, financial aid, exit counseling and other practices at for-profit schools. Patrick Forrest: Coming Out of the Liberal Closet! * Patrick Forrest is Openly Homosexual... He was endorsed by the Gay & Lesbian Victory Fund. * Patrick Forrest supports illegal immigration reform. He is a Federal Gov't immigration attorney, who worked for migrant farm workers. * Patrick Forrest worked for President Obama's Transition team. * And finally, Patrick Forrest has voted in Democratic Primaries. A liberal Republican, like Patrick Forrest, is a greater threat to the conservative agenda than a Democrat will ever be. The return address says, "Paid for and Authorized by Our Heritage USA, 306 12th Street, Lynchburg, VA 24504, and repeats the "Coming Out of the Liberal Closet," with heavy emphasis on the "coming out" bit. Our Heritage USA doesn't have a web site I can find, and the Google Maps result for 306 12th Street Lynchburg isn't particularly enlightening. As to the context of the postcard -- Patrick Forrest, a resident of Reston, VA, is the Republican candidate running against Democratic incumbent Janet Howell for the Virginia State Senate in the 32nd District, which covers portions of Fairfax and Arlington counties. His campaign Web site doesn't mention his sexuality, though he is listed on the Gay & Lesbian Victory Fund site and he's apparently been pretty open about it in news coverage which I hadn't been paying attention to. As to the second bullet, about supporting illegal immigration reform and being a Federal Gubbmint immigration attorney, I'm not sure why this is supposed to be a bad thing, other than it includes some hot-button keywords. According to the campaign Web site, he worked for the Department of Homeland Security as lead counsel for the E-Verify program (you know, the program designed to filter out illegal immigrants from employment), so it's kind of a weird attempt to smear based on buzzwords. The other points seem to be half-truths -- he was on the Homeland Security Presidential Transition Team in 2008 (while working for DHS, hardly a partisan matter). As to the voting in Democratic primaries, Virginia is an open primary state and you don't have to register with a party, so it's another pretty silly smear attempt. I haven't been paying attention to the local races -- I just assumed that incumbent Howell was pretty safe given the general blueness of the area -- and I wasn't even aware of candidate Forrest until today's postcard. In my exhaustive Friday night research, I see the Washington Blade had an article yesterday about negative campaigning by the Victory Fund on behalf of Forrest, though previous coverage looked at attacks on Forrest by the other side. Anti-Gay Smear or Sneaky Political Tactic? Knowing nothing about "Our Heritage USA," and seeing the Lynchburg VA address, the initial assumption would be that it's a clumsy attempt by a conservative group to smear a gay candidate. But then again... this is a general election, not a primary. Given the closeness of the margin of control of the Virginia State Senate, would Republicans throw one of their own under the bus by essentially saying "let the Democrat win" this race? Putting on my conspiracy hat, I wonder if this might be a reverse-psychology attempt by a Forrest partisan to siphon moderate Democrats away from incumbent Howell. The controversy around the anti-gay message would generate outrage and gather attention to the race, and would at least help with name recognition for the challenger. Though it's awfully close to Election Day -- you'd think a tactic like this (if it were indeed a tactic) would have been better a few weeks ago. This is why transparency and reporting is important when it comes to political financing, kids. If you have any questions, please contact AOL.Listserv.Service@teamaol.com. Thank you. Technically, I was listed as an owner of a few listserves, but they don't seem to exist any more, at least not any that I could send to.